The sphere is inflated by a silent air turbine, the blower, which maintains a light pressure into the Bubble. It keeps the air fresh and avoids problems with moisture. The atmosphere inside the bubble is healthy, with no condensation, mosquitoes or dust. Here are some detailed pictures of Clear bubble tree linflatable lawn tent for yard below for your reference, please check. There are some buckles on the bottom of dome for anchoring. Client can use some sandbags or stone and ropes to fix the dome on the ground firmly. 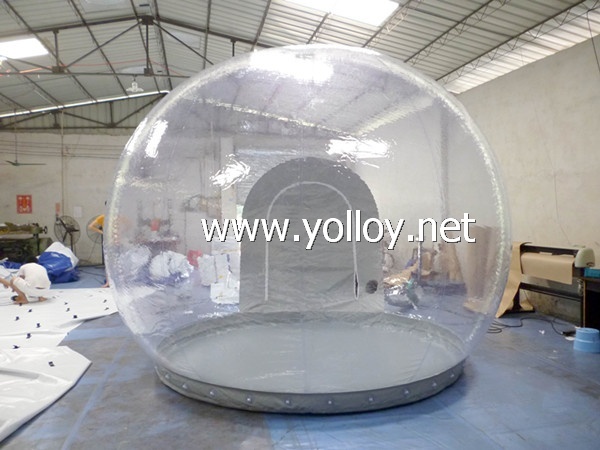 There is a air frame inside the tunnel.It convenient for people get in and out and makes the tunnel stronger and more stereoscopic.And the frame is air sealed structure,once inflating the air can be hold inside for many days.Clear bubble tree linflatable lawn tent for yard is very convenient for people get in and out.